It’s hard to imagine a living room — or board room — where Netflix needs an introduction. Today, it boasts over 65 million subscribers across more than 40 countries. Even its culture document went viral to become part of startup canon. It spurs hundreds of cable cancellations daily. Yet when former VP of Product Management Gibson Biddle joined Netflix in 2005, the product expert still had focus groups asking him: “Wait, I don’t get it. Do you mean streamlining?” No, streaming, he would say. No one knew what that meant. In the early days, building the company’s brand meant not only finding ways to promote and position the “brand promise” of Netflix, but also introducing — and owning — language that was fundamental to an incredibly new business. Beyond Netflix, Biddle has led and advised on brand creation and product development for landmark education and gaming companies, including Chegg, Sega and Mattel. Biddle’s track record as a product leader stems from his ability to delight customers in hard-to-replicate, margin-enhancing ways. Network effects, economies of scale, and unique technology are commonly understood ways to create a hard-to-copy competitive advantage, but few understand the discipline required to define and build a brand. Like a company’s mission or vision, a well-defined brand describes a “true north” that informs the company’s product development. And at world-class companies, you often see exceptional teamwork between marketing and product teams, where the marketing team defines the brand, and the product team helps bring it to life. Here, Biddle offers three simple and powerful tools to define an enduring brand starting now. “A lot of people are intimidated by branding. They think, ‘I'm not an artist, I'm not a writer. I can't come up with something,’” says Biddle. There’s too many nebulous guidelines and abstract words thrown around about brand creation: “Brands should come from the heart.” “They are authentic and sustainable.” “The best are built with the strength of the human spirit, not an ad campaign.” None of this helps if you’re thinking about concrete deliverables. A brand is the unique story that consumers recall when they think of you. What is it? Be descriptive. What are the customer benefits? How does it improve customers’ lives? What is its personality? If your product, company or service was human and you met at a cocktail party, how would you describe him/her? Of course, there are levers and pitfalls to consider when answering each of these questions. To address these, Biddle has suggestions and illustrative examples to guide your process. Here, he uses snack subscription service Naturebox, which he advises, to illustrate concepts that have worked for him at Netflix and throughout his career. Avoid positioning exercises alone or in silos. So how can you start with something like this and arrive at crisp, unanimous positioning language? Describe it to a sixth grader. “Aim to be succinct and clear. Pretend you’re speaking with a sixth-grader. Your customers are busy so they don’t have time to parse fuzzy concepts. Your goal is not to dumb it down, but to tighten it up. ” Biddle challenged Group A to unpack “custom subscription snackbox.” One person offered: “Snackbox Delivered to Your Door.” That was too “salesy” for Biddle. “Snackbox Subscription Service.” That works. What would someone with zero context and limited knowledge of your business understand right away? Go with that. Put your descriptions on a diet. Don't stop until there's precision. “There’s typically one fuzzy word in the bunch. Find that abstract word and dig deeper into it,” says Biddle. He prompted Group A to unpack “variety” until the team arrived at “choice” and then “selection.” “Selection” is a better fit for Naturebox, as the company aims to not only provide a range of products, but also a deliberate curation of healthy snacks. “Don’t give an automatic pass to words that are popular across teams,” warns Biddle. “Everyone’s a suspect.” Both Groups A and B chose “unique.” “Unique in what way?” he persisted. “Its great taste — it’s tasty,” the team responded, providing a more exacting answer. Introduce your company like you would a person. Decide on one word to own. Ten years from now, what word do you want to own? Express the benefits from the point of view of the customer — not the company. As you express your company’s benefits, always put — and root — yourself in your customers’ shoes. For example, Biddle remembers when online textbook rental company Chegg reached a milestone related to one of its customer benefits: saving money. The company was proud that the cumulative student savings for all Chegg customers for the year was $500 million. But in A/B testing on its homepage, that message didn’t convert well. A/B testing demonstrated that the phrase “save hundreds of dollars” by renting instead of buying worked best, but it would have been a safe bet after returning to Chegg’s positioning framework. The $500 million savings said more about Chegg, but “saving hundreds of dollars” spoke more to students using the service. Emotion is how you will be remembered. An emotion can be both a positive or negative sentiment, but it’s always personal, so it’s critical to choose wisely because it will stick. Think of your most embarrassing moment. No matter how long ago it was, you still remember it, and it still has the power to make you feel something, right? In the context of a company, emotion is the bridge between how the product will benefit the consumer and how the company will benefit the world. It’s a lot of ground to cover, but the right emotion is powerful and memorable enough to link them together. “Emotion can transform a cold piece of technology into something that people deeply relate to in their lives,” says Biddle. Bet big on your "something bigger." At the heart of “something bigger” is one question: What will you do for your customers — and more importantly, for the world at large? For Apple, that is delivering “revolutionary innovation.” Examples abound throughout its operations: market-changing consumer electronics, the distinctive design of its retail stores and its Think Different campaign featuring iconic changemakers such as Nelson Mandela, Albert Einstein and the Dalai Lama. While there’s no cookie-cutter model for identifying that “something bigger” for your company, one of the best ways to arrive at it is to take a thorough look at how you arrived at your mission and vision. What emotional response do these statements provoke? Take those feelings and try to elevate them with language designed to appeal and deliver on your long-term promise to customers. Once you’ve defined your positioning in the first model and how your brand levels up into the emotional realm, it’s time to represent your ideas to potential customers. Biddle is a strong advocate of brand hacking — building, testing and learning quickly. He points out that “words are cheap.” It’s easy to create multiple variations of a few key ideas — to develop a range of concept summaries — to see whether the language, and to some extent the ideas, resonate with customers. A good concept summary takes all of the thinking from your positioning model, branding pyramid and internal discussions about what your company wants to be when it grows up — and reduces it to one paragraph. It must answer the question: Do people understand who I am, my benefits, my personality and the something bigger I will represent? Sometimes it’s hard to find a movie everyone can enjoy on a Friday night. For individuals and families with internet access, Netflix instantly streams an unlimited number of TV shows and movies, anytime, anywhere. Simply search, browse and watch on the easy-to-use website, mobile apps, apps on game platforms and hundreds of Internet-connected devices. With one-click anyone can watch ad-free, HD quality, TV shows and movies. It’s month-to-month and you can cancel anytime. We offer a one month free trial. Netflix, it’s movie enjoyment made easy. It's a reliable gut-check when you make product decisions. During Biddle’s time at Netflix, there was an internal debate about how to improve retention. The first option hinged on the premise that an entertaining, more cinematic experience would be the solution. The reality is you're growing up as a company. You're getting smarter, better, faster. You're learning. At Netflix, my colleagues were constantly testing the non-member homepage — the page whose job is to convert potential customers into customers — every two weeks, forever. The second option was more reminiscent of an automated vending machine that displayed the movies as tiles in rows across the screen — largely what you see today on the site. While the product team found this approach less interesting and technically challenging, it tested better quantitatively. “It was good that we tried both options, but our concept summary might have delivered an early prediction. We needed to remember: Movie enjoyment made easy. This second option was the fastest, easiest way to get people into their movie experiences,” Biddle says. “Netflix differentiated itself by really pushing on convenience, selection and value — we went from a DVD delivery service to streaming TV shows and movies instantly on hundreds of devices for just $8 a month. Your concept summary helps you communicate your brand more effectively. For young companies building their brands, it’s common to express a lot about the company’s benefits or technology at the beginning. For example, Netflix used “watch instantly” in lieu of “streaming” until its consumers became familiar with the terminology. As people become more familiar with your brand and technology, a lot of the work you need to do to communicate what your product is and the benefits it delivers falls away. 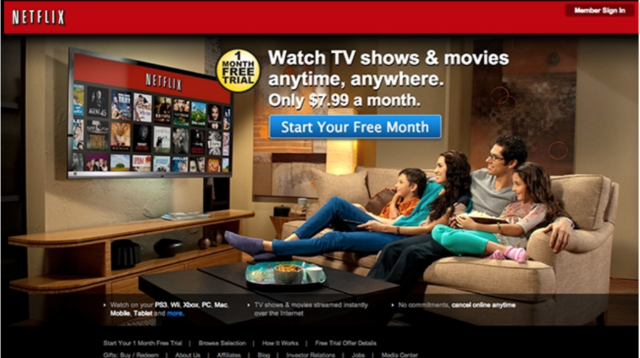 In the early days of Netflix, the non-member homepage was complicated. 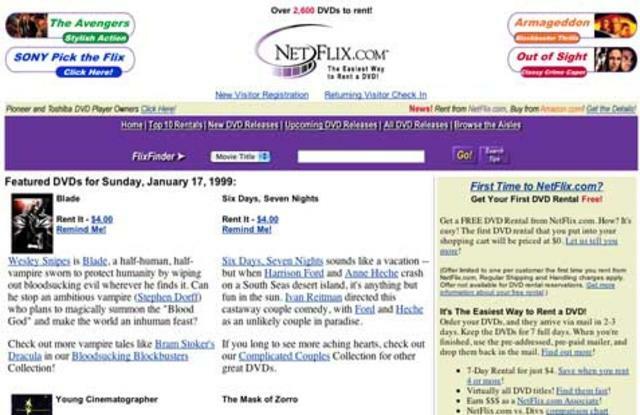 But over time, as the brand grew and successfully embodied the notion of “Movie Enjoyment Made Easy,” the work of communicating to customers got easier and easier, and, consequently the non-member homepage got simpler. It was a milestone when we realized that the information that was once on the homepage was now in our customers’ heads. 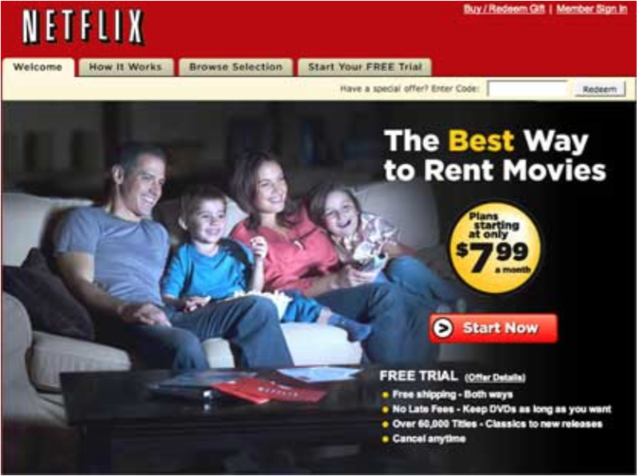 Netflix.com in 2015: Will promoting original content improve conversion? A good concept summary is a record of the timeless and temporal parts of your brand. 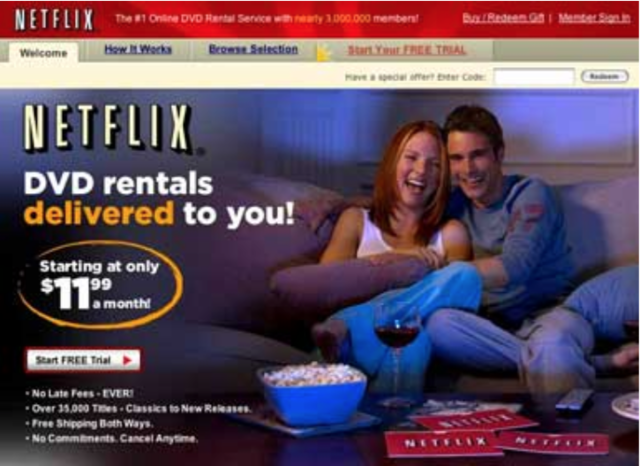 About a decade ago, Netflix offered a selection of 100,000 DVDs. Eight years ago, it introduced its streaming service. In recent years, it launched its first original television series. Through every transition, Netflix was always about movie enjoyment made easy. This brand promise captures both the timeless and changing elements of the brand. 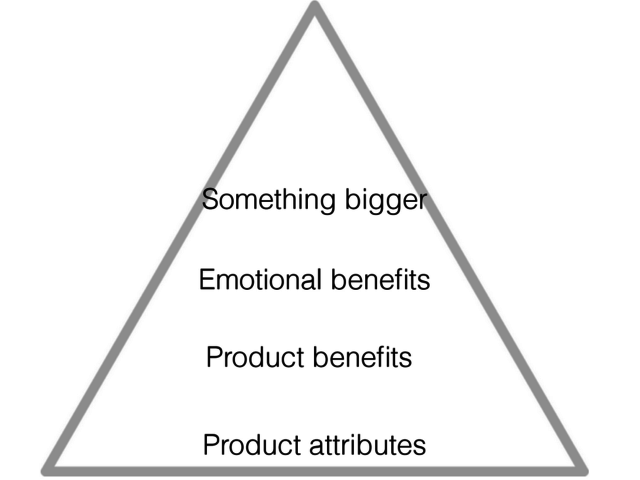 “Product attributes are the one element that will change over time. The benefits will largely be the same. If you're really good in the early days, the emotional benefits for the customer will be constant. Even the ‘something bigger’ that you’re shooting for will stay the same,” says Biddle. This original content is a good example of a company’s attributes changing over time, but still delivering on that same brand promise. A concept summary uses everyday, non-sales language to communicate elements of your brand pyramid and to explore what resonates with customers. Biddle is careful not to choose one brand concept or another based solely on qualitative evidence. That’s the realm of A/B testing. He likes to extract the benefits from a concept summary and A/B test them on a company’s homepage to get customer feedback. Startups may not have the resources to hire a team of marketers to run focus groups for a year, but they can choose the customers they seek out. “Find a way to talk to normal people about your concept summary. Use clear, simple language — without any Silicon Valley jargon. Speak with people outside of your zip code.” Biddle suggests using WebEx or GoToMeeting as cost-effective ways to have engaging conversations with customers located time zones away. You’ll get some of your best ideas from everyday people and customers you’ve never thought to ask.